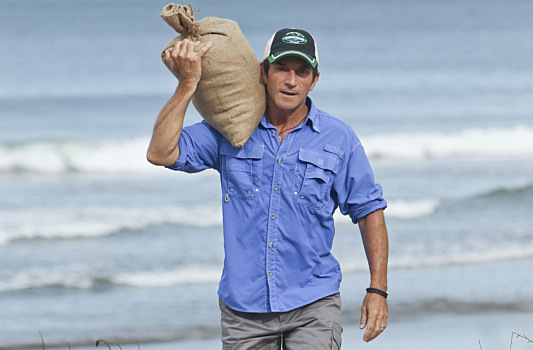 I can’t concentrate on anything during this week’s Survivor except the impending visit from Jeff Probst. What will he ask the blue tribe for in exchange for food? While we wait for the wheeling and dealing to start, Dale presents a faux Immunity Idol to some key tribe mates on the orange tribe. Jon buys it because Jon is an idiot. Okay okay okay, Jeff arrives on the blue tribe’s beach. He’s carrying a sack of rice on his shoulder so he means business. Julie’s crying which I didn’t think she could do after the surgery. Jeff can only remember one other time that a tribe needed their rice replenished, and that was in Australia and there was some sort of flood involved. It’s fourteen days in, and Jeff declares this tribe The Worst. “In fairness of the game…the penalty for [eating all of your damned rice] has to be just. “ Jeff wants the tarp, the hammock, the bed roll, the pillows, the blankets, the candles….the hatchet, the hammer, one of the pots, and the extra flint. Um, is there a Bed Bath and Beyond on the beach? Where did they get such lavish stuff? Are those scented candles? Anyway, that leaves the blue tribe with a machete, a pot, and a piece of flint. They take the deal and will be playing the game how it should be played. During a boring Immunity Challenge involving blindfolds and touching, Reed wins reward for the blue team and Natalie volunteers to go to Exile Island with Baylor from the orange tribe. The reward is a delicious kabob meal…and they get to keep the grill. But without a tarp or a bed or a loofah, life is hard at the blue tribe’s camp and Julie cries her way through the cold, rainy night. The Immunity Challenge is a puzzle piece collection flag puzzle solving kind of game that also involves rolling a giant wooden cube along the beach to create platforms tall enough to reach the puzzle pieces. After trailing through an exhausting challenge, the blue tribe catches up on the puzzle portion because Josh and Reed are the perfect smarty pants super couple. And with that, the blue tribe continues its winning streak while the orange tribe is headed for Tribal Council. While grilling crabs on a skewer, Dale cuts a deal with Jon—if he makes it through the vote, he will give Jon his [fake] Immunity Idol. Have these idiots never seen the show before? I mean, how stupid do you have to be to buy the old fake Immunity Idol routine? It doesn’t even look like an Immunity Idol, it’s all puny and sad. Okay, not that stupid because the plan is to split the vote between Dale and Keith, just in case it’s a real Immunity Idol. There ought to be some sort of price check scanner, where players can check and see if it’s a genuine Immunity Idol before the vote. Then again, that wouldn’t be much of a game. The jibber-jabber is a snore, Dale fails to play his [fake] Immunity Idol, and Jeff reads the votes: Dale, Keith, Missy, Keith, Dale, Dale. Sorry, Dale. You tried, but you just had no hand to play.